The Fatimids were perhaps the last of the Great Islamic Empires to be beholden to a martial tradition not borne of Turkish-influence, their armies based more around the conjunction of infantry and spear-bearing cavalry than offering sizable contigents of tribal horse archers or iron-discipline Ghulams (Though the latter did make up some part of their equestrians). The sword and scepter by which the Shi'ite Caliphate held its dominion was by it's infantry, mostly sword, javelin, and spear wielding Sudanese Slave Warriors, and its cavalry, premier amongst them the Ajnad. Their ranks were highly varied, consisting of Maghrebis, Sudanese, Syrians, Egyptians, Armenians, some Ghulams and even some Europeans. In sharp contrast to the bow and mace oriented Ghulams of the Turkish dynasties, the Ajnad were recognized as medium to heavy cavalrymen specialized in the use of spear in the traditional Middle Eastern manner (Rather than the couched lance of the Latin Christians)./n/nSaladin's purges of Fatimid loyalists coupled with an increasing focus on Kurdish and Turkish Ghulam horsemen have left the ranks of the Ajnad to atrophy, being a shadow of a worth once commented to seem a reflection of the Crusading knights in armor and tactics. 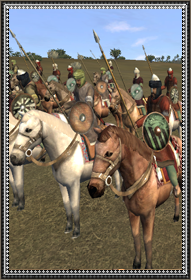 Consisting of Syrian, Egyptian, and Arab officers supported by Iqtas' (land grants in lieu of a regular wage), these provincial troops serve more as light cavalry of the Bedouin tradition than the solid horsemen borne from Khurasani and Byzantine influence on the Abbasids and Fatimids.